Forrás: Daily Mail. Szerző: Thomas Burrows. A mother fears her 12-year-old son could be scarred for life after a tattoo he had on a family holiday left him with horrific leg injuries. Ethan Crosland, from Rawthorpe, Huddersfield, was allowed the temporary Henna tattoo as a treat while on a family holiday to Egypt. But he was left in agony when it burst into raw blisters and left his leg red and swollen. Doctors are treating Ethan with antiseptic creams and antibiotics, but cannot rule out the tattoo leaving permanent scarring. Now Ethan’s mother, Emma Lindley, has warned others to beware of the risks. She said: ‘There were young toddlers racing around the hotel complex who had them done and things could really go wrong for them. ‘We don’t know why Ethan’s tattoo has developed as it has but I wouldn’t want others to go through what he has done’. Ethan, a pupil at Rawthorpe High School, visited Sharm El Sheikh on August 3 for a two-week holiday with his five-year-old sister Tayler-Mae, mother and her partner, Marcus Pennington. They stayed at the four-star Aqua Blu resort, that boasts the biggest water park in the area. 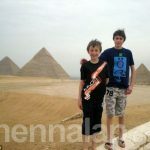 Miss Lindley said: ‘Unfortunately after a day or two, I had to take Ethan to the clinic as he had developed an ear infection. ‘We think it was from swimming in the pools and the doctor advised him to stay out of the water for a few days. ‘There was a salon on the complex with the henna tattoo parlour and as a treat for Ethan, I said he could have one done. ‘He had it on his leg and it was fine for a few days. The tattooist said she would top it up the day we left so he went back and had it inked in again. 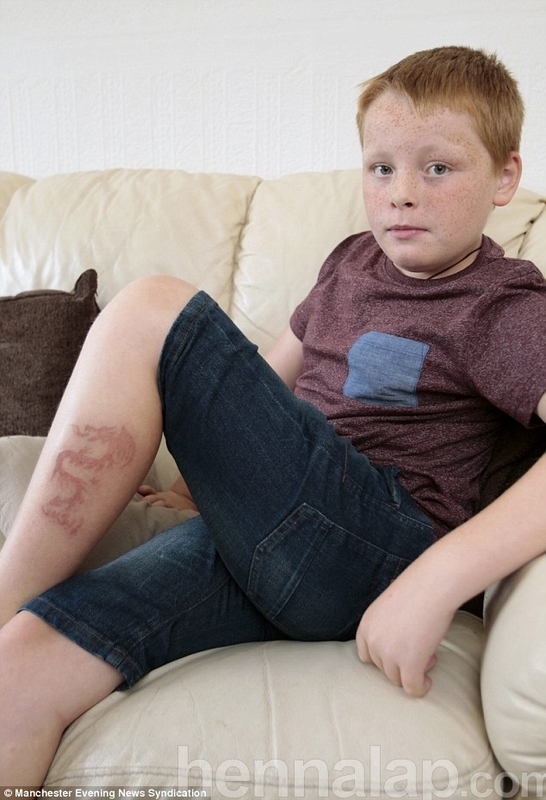 ‘But a couple of days after we got home, Ethan said his leg was really itching and we saw that the tattoo had come up in huge blisters which were bursting. ‘He has been down to the doctor who has prescribed creams and more antibiotics, but we don’t know if there will be any long-term damage’. Ethan has to have the dragon tattoo covered in cream to try and bring down the swelling – and thankfully, the pain has eased thanks to the medical treatment.